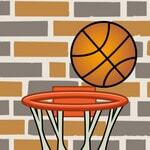 Get to a ring basketball balls and earn bonus points to set up the personal record! It is supposed to make only 3 misses then game will be ended. In game of 3 rings thanks to what, there are chances to get a ricochet in the bottom.